I hit the gym four times a week, take spinning classes regularly, and use work-outs as my go-to stress reliever, so you could say I’ve got my exercise routine down. But knowing my way around a gym didn’t make it any less intimidating to try out a Pilates reformer, a device originally invented by Joseph Pilates in the 1900s to help hospital patients strengthen their muscles. The exercise studio Pilates ProWorks recently opened their first location on the East Coast, in New York City, and invited me to try a class using their reformer, a modified version they call a FitFormer. Normally I mix up my cardio machines and floor exercises, but I generally stick to a fairly safe fitness pattern. So I was a little—okay, a lot—intimidated to try a reformer. They look eerily like some sort of torture device, and I wondered where I was supposed to sit, lay, or stand, among all those bands and springs. Did I need double-jointed limbs to make it through this workout? But I’m always up for a challenge so I said sure, why not? I'd at least tried mat Pilates before, albeit from a DVD I used for a few months…years ago. I brought a friend and fellow health journalist along for the ride. Hey, if I was going to look silly, I’d rather not look silly alone. Our instructor explained the basics. (The FitFormer has more springs than the traditional machines, which provides more combinations of resistance.) After some light stretching, we got started. The class size was just right—full, it held 12 people—and the pace was perfect. The instructor quickly explained each move, which we performed for one minute (other classes may be structured differently). It was enough time to really feel the burn, maintain momentum, and keep things interesting. It was pretty easy to get into a position by watching other people in the class who seemed to have experience, and I never felt overwhelmed or frazzled. This makes sense since the Pilates technique focuses on control and form. Though the first reformer was designed to help rehabilitate wounded soldiers, the modern equipment helps students perfect their technique. After only a few minutes, I knew I was going to be a fan. Before the class, I worried I wouldn’t break a sweat. Wrong! The 55-minute routine required power and concentration to get the moves right, and there were some serious bursts of cardio incorporated, too. I felt like I was working hard, but in a different way than I'm used to at the gym, which was refreshing. The workout allowed me to really pinpoint the areas of my body that were stronger than others. For instance, I felt more confident when the focus was on my abs and obliques rather than my hamstrings or abductors (the muscles on the outside of the thigh). Instead of feeling weak and frustrated, I found myself setting a personal goal to get stronger. That’s the amazing thing about Pilates—I find it to be a peaceful workout, but I feel such a surge of adrenaline to work harder, push more—one...more…rep. 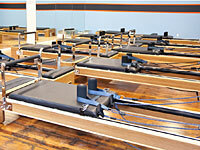 So what did I think about the reformer? Well I can safely say that it didn’t eat me alive, and I prefer it over traditional mat Pilates. The machine did not let me cheat—ever. One thing to keep in mind though, is cost. The studio offers both individual classes, grouped packages, and monthly memberships, which range from $35 for one class to more than $1,000 for the most all-inclusive option. Coupled with my current gym fees, a large package might not be the best option for me, but supplementing my typical regimen with reformer classes every so often is definitely doable. Overall, I found it's great way to mix up my workouts and keep my muscles guessing—crucial for avoiding a fitness plateau. I left wanting more, so I’m giving myself a month of classes to see where I can take my body—just in time for my annual spring vacation (and bikini weather) with my best friends. My hope is in four-weeks time I’ll have better balance, leaner legs, and more flexibility.